“Beautiful, Breathtaking, Stunning, Mesmerizing, Spectacular, Serene, Tranquil…” These are just a few of the words used by many visitors to describe Ragged Falls. It’s no wonder it was voted top 10 water falls in Ontario. There is a short well-groomed trail which leads to an overlook and the view is equally impressive from the bottom or the top. Wander around, revel in the natural beauty and rock faces, have a picnic, boat or swim at the bottom. What is even more fun is to hop in any form of boat (canoe, kayak, motor etc.) and boat your way up the Oxtongue river to arrive at the base of the falls. 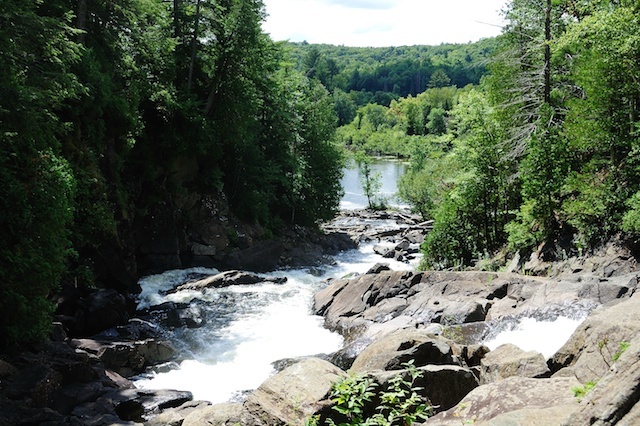 Not only has this stretch of the Oxtongue River been painted by Tom Thompson and the Group of Seven, but many local and foreign artists and photographers have made the Oxtongue River and Ragged Falls part of their portfolios. Truly a spot that can’t be missed. The true glory of the falls can be seen with rushing water in the spring but Ragged Falls as something special in every season that makes it a must see spot every time you come. The ice formed water flows in winter are stunning and remarkable, the water rushing with red, orange and yellow leaves as the backdrop in fall are glorious and the summer greenery,warm waters and lower water levels allow for more exploration along the top and bottom. A marked gravel road provides access to Ragged Falls. Washrooms are on site, in the parking lot. A parking permit is required and can be obtained from a central parking meter.